Boisterous laughter greets the jokes, or anything resembling a joke, in the opening minutes of [title of show], the phenomenon about two guys writing a musical about two guys writing a musical, and it appears that this might be a show only for those already fans of the off-Broadway production. But sharp wit, entertaining tunes and engaging characters win over the skeptic and prove that this “stage of dreams” has what it takes to compete in the Broadway big league. In real life, as well as on the stage, the show starts as an entry in the 2004 New York Musical Festival. Faced with a three-week deadline and few ideas, Jeff Bowen (music and lyrics) and Hunter Bell (book) decide to write a musical about writing the musical. 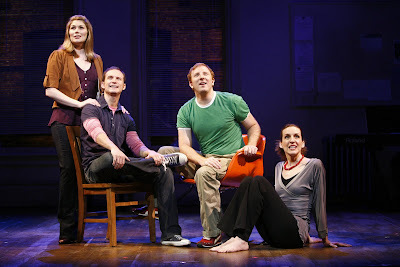 They interest friends Susan Blackwell and Heidi Blickenstaff in the project and the show, which features the four performers playing themselves, is a virtual recording of their conversations during its creation. The set (Neil Patel) is bare except for four chairs, spike tape and a keyboard on which all of the songs are accompanied by sole musician Larry Pressgrove (musical direction/arrangements). We get to know the foursome (they’re fun to hang out with) as they share their adventure and innermost thoughts. Jeff, hopes to get the words “Wonder Woman for President” included in the musical; Hunter wants to strangle the wordsmith who’s always correcting his grammar; Heidi wonders whether “downtown” Susan really likes her and whether she'll ever be more than an understudy on Broadway; Susan, who has been told that her voice isn't good enough for the Great White Way, worries about being in the show. "Don’t worry," Hunter tells her. "We’ll replace you when we get to Broadway." A warm rush of laughter comes from the audience which realizes she's standing on the stage of the Lyceum Theater. The scenes are linked by humorous phone messages detailing rejections from noted Broadway actresses asked to star in their musical and angst turned into musical numbers with deft direction and choreography by Michael Berresse. Following the festival, the show enjoyed a cult following off-Broadway. Bowen, Bell and Berresse each won 2006 Obie Awards for their work. The run ended, but Bell wouldn’t give up on Broadway and gave the show new life in an internet video series. The wildly popular “The [title of show] Show” http://www.youtube.com/watch?v=lrqFDczlobQ chronicled the musical’s “if you stage it, they will come” dream and springboarded the production to Broadway. The joke about writing a musical about writing a musical can only go so far, however, so some of the 90-minute, no intermission presentation seems a little forced, like an unnecessary kiss shared by the two women, and a self-aggrandizing number to show off Heidi’s voice that seem to stop the flow of an otherwise entertaining romp. Overall, [title of show] is a fun look at the inside world of creating musicals and a pat on the back to the indomitable spirit which pursues a dream despite the odds. * The two male characters are gay, but not involved with each other. * One actress removes her shirt to reveal her bra. Eugene O'Neill describes the setting for "A Long Day's Journey into Night" and suddenly dark wood panelling, a bookshelf under a portrait of William Shakespeare, a round table and chairs with three windows from which you can overlook the water surround me, not because I'm imagining the room as I read, or admiring set work while viewing the play, but because I'm sitting in the room itself, where J Ranelli directs a reading from the classic. The room, exact in detail as described in the stage directions of the play, is in O'Neill's boyhood home and the reading is the first event in which I'm participating as a fellow at the National Critics Institute at the O'Neill Theater Center in Waterford, CT.
Ranelli, one of the most skilled directors I've ever worked with, brings O'Neill's words to life as he guides the actors through selected scenes. The idea is for us critics, who review plays, to get a better understand of how a performance comes to be. I get even more than that out of the experience. Ranelli suggests that the two actors playing Edmund and Jamie go out into the kitchen and enter the room laughing, just as described in the play's stage direction. They do, and the effect is chilling. I feel as though I'm living inside the pages of O'Neill's autobiographical work and expect to hear the melancholic foghorn. I can feel his pain, the frustration of a disfunctional family trying to make it through the day while denying, then trying to deal with the mother's drug addiction. It's gripping and I realize that this is why I do theater: to move the people watching. To try to touch them with the material in a personal way and, in our case at Masterwork Productions, where our projects carry a message of hope, to offer them something to think about and in some cases, a solution. The experience leaves me with a strong sense of confirmation and a bag full of directing techniques gleaned from Ranelli's years of experience in theater and television that hopefully will make me a better director, both of theatrical endeavors and of this performing arts organization. He stresses a mentoring relationship between director and actors and I realize that this type of relationship is what brought me here in the first place. Friend and Broadway critic Retta Blaney has encouraged me to pursue writing reviews of Broadway shows from a Christian perspective. A few of those reviews earned me a spot as a follow at the institute and now God has opened the door for mentoring from some of the nation's top critics. It's amazing how many doors God can open and not surprising that he uses mentors like Retta to turn the door knob. I have been accepted as a fellow at the 2008 O'Neill Critics Institute in Waterford, CT and will be learning from some of the best arts writers in the country during the next two weeks. The institute is held in conjunction with the National Musical Theatre and Playwrights Conference. Two weeks on the beautiful Connecticut shoreline talking and writing theater with writers, performers and directors; what's to criticize? Because of the schedule and possible limited internet access, I'm not sure whether I'll be able to post regularly through July 22, but check back often as I'll write about the experience as soon as possible. Flying creatures, breathtaking acrobatics and delighted children come together in "Cirque Dreams Jungle Fantasy," an unusual Broadway offering at the Broadway Theatre. 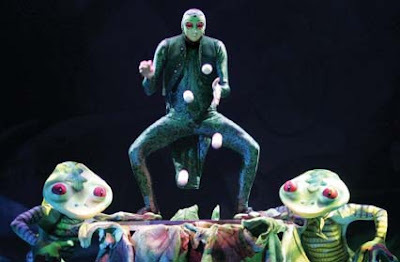 The creation of Neil Goldberg, Cirque toured the country before landing on Broadway to the delight of all the children who were seated near me. It's an exotic encounter in the jungle, brought to vivid life by a cast of 28 aerialists, contortionists, acrobats, jugglers and musicians dressed in more than 150 of Lenora Taylor's every-color-imaginable costumes. Less cerebral than Cirque de Soleil, Cirque Dreams has a story you can follow, lyrics in English and is specifically geared toward kids. We were treated to some spectacular jump roping, a slow crawling turtle, a juggling frog and ribbon flyers. At intermission a dad next to me wondered what else could be presented in the second act and whether his children would remain entertained during it. The answer was lots and yes. A giraffe balancing act had the audience gasping and covering their eyes as Vladmir Dovgan and Anatoliy Yeniy added a fourth platform to their balancing tower. And cleverly, the second act is set in the jungle at night, so the millions of colors glow with a neon-like effect. The choreography by Tara Jeanne Vallee is great, with performers in time to the music, even on the trapeze. The Broadway belt voice of Jill Diane (Mother Nature) felt a little heavy for Jill Winters' score and lyrics, but didn't distract from the fun. Jared Burnett, a classically trained violinist, stands out as the character Soultree Violinist, who serenades through the show on a six-string electric violin Viper created for Cirque. A couple of brief attempts at humor involved some more mature movements that seemed out of place in a show geared toward the little ones. Offering the man bracing a pyramid with his head a few aspirin, for example, might have brought more laughs than more mature movements that hopefully went over the heads of the youngsters. The limited engagement runs through Aug. 24. A great family fun show with characters appealing to children, minus the usually "dark" villains most children's shows feel they must include.